The great hornbill (Latin name Buceros bicornis) also known as the great Indian hornbill or great pied hornbill, is one of the larger members of the hornbill family. It is found in the Indian subcontinent and Southeast Asia. Its impressive size and colour have made it important in many tribal cultures and rituals. The great hornbill is long-lived, living for nearly 50 years in captivity. It is predominantly frugivorous, but is an opportunist and will prey on small mammals, reptiles and birds. Hornbills are large birds and you might hear them earlier than you see them. If they fly overhead their wings make a whoosh-whoosh sound. They are regularly spotted during our treks in Khao Sok National Park. 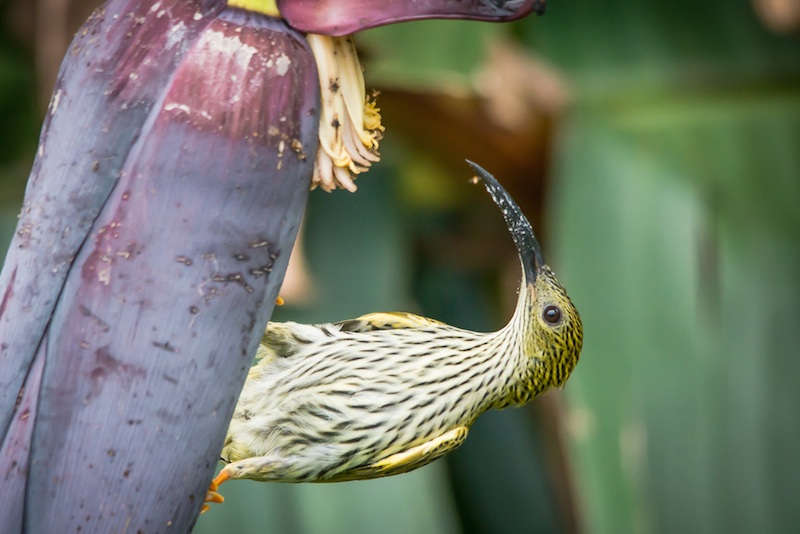 On the IUCN Red List of Threatened species The streaked spiderhunter, latin name Arachnothera magna, is classified at “least concern” due to it large range. It is found in Bangladesh, Bhutan, Cambodia, China, India, Laos, Malaysia, Myanmar, Nepal, Thailand, and Vietnam. Its natural habitats are subtropical or tropical moist lowland forests and montane forests. This species can be found alone or in pairs. The nesting season is from March to July. The nest is usually made of leaves that are tied together with cobwebs, and they are found attached to the reverse side of a leaf. 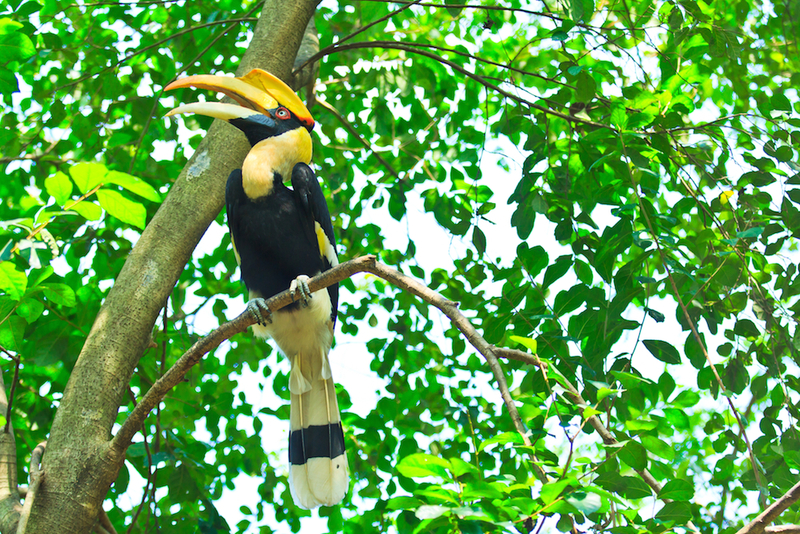 Keep your eyes peeled for this lovely bird during out full day trek through Khao Sok National Park. Thanks to Rushen Bilgin of Thai National Parks for the picture. The hornbills (Bucerotidae) are a family of bird found in tropical and subtropical Africa, Asia and Melanesia. Both the common English and the scientific name of the family refer to the shape of the bill, “buceros” being “cow horn” in Greek. Hornbills have a two-lobed kidney. They are the only birds in which the first and second neck vertebrae (the atlas and axis respectively) are fused together; this probably provides a more stable platform for carrying the bill. The family is omnivorous, feeding on fruit and small animals. They are monogamous breeders nesting in natural cavities in trees and sometimes cliffs. 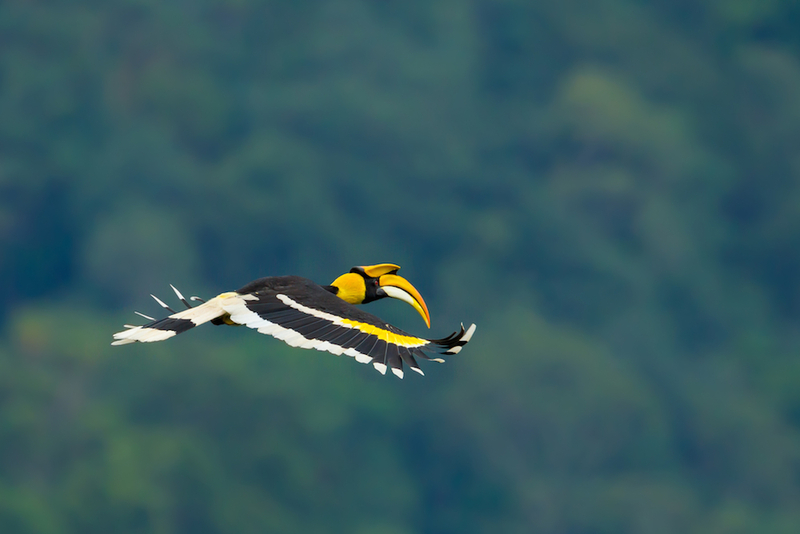 A number of species of hornbill are threatened with extinction, mostly insular species with small ranges. 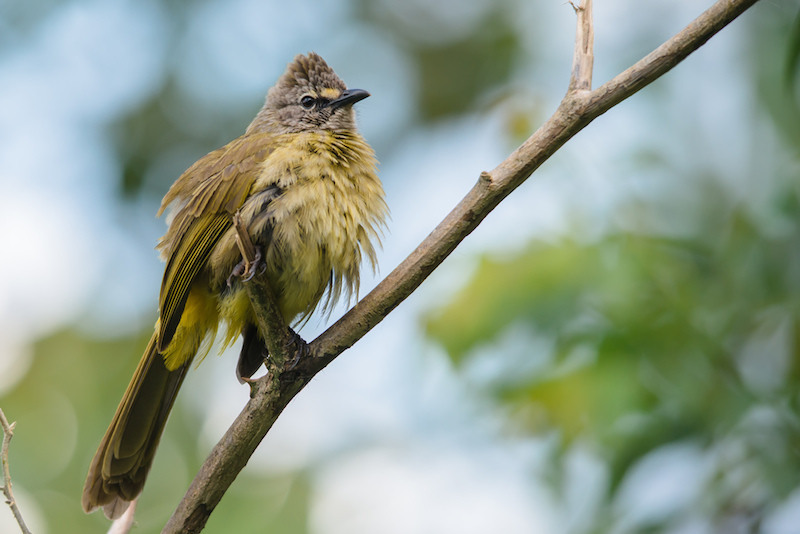 The flavescent bulbul (Latin name Pycnonotus flavescens) is a common sighting around Anurak Lodge. Its name comes from “flavescent” which means yellowish or turning yellow. The bulbuls are a family of medium-sized songbirds. Many forest species are known as greenbuls, brownbuls, leafloves, or bristlebills. The range of Bulbuls includes most of Africa and the Middle East, tropical Asia to Indonesia, and north as far as Japan. On the IUCN Red List of threatened species it appears as “least concern”. There are over 150 bulbul species. 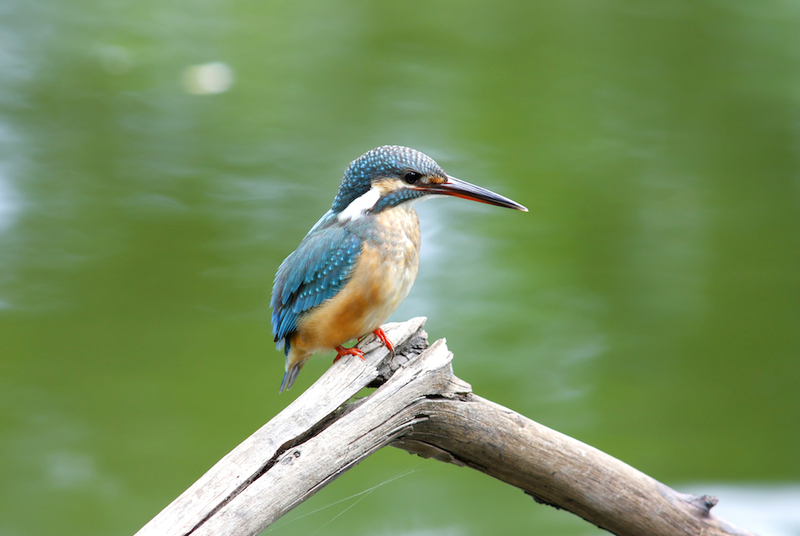 If you have binoculars you might spot this beautiful little bird during your Khao Sok River Canoe tour. Thanks to Rushen Bilgin of Thai National Parks for the picture. The common kingfisher is a very common bird. It has an extremely large range which means you can observe this species in many parts of the world. Apart from Southeast Asia it occurs in Europe, the Middle East and parts of Africa. Even in the Netherlands you can see the Common Kingfisher. It is a very pretty, colorful bird, the size of a sparrow. It has blue upperparts, orange underparts and a long bill. Common kingfishers feed mainly on fish. They catch fish by diving into the water. It has under water vision to enable it to see its prey u. Needless to say: when water gets frozen over kingfishers leave the area and migrate to other places. You often can see this little bird on the Sok River so keep your eyes peeled if you are on our canoe, tubing or bamboo rafting trip. The common kingfisher usually flies low and very fast.